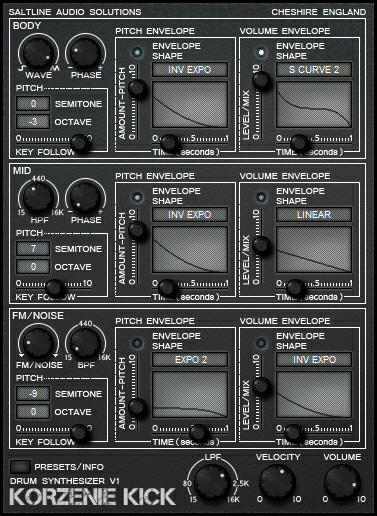 Korzenie Kick, Virtual Percussion Synth from Saltline in the Korzenie series. Saltline is working on a new plug-in series that aims to reproduce the sound of vintage drum machines. The Korzenie series currently offers two plug-ins, the free Korzenie Kick in final v1.0 and the Korzenie Clap that is still in beta version. Both are available for free and are in VST 32-bit format for Windows. Korzenie Kick is dedicated to synthetic kick drum sounds and features three layers (Body, Mid and FM/Noise), each with its pitch and volume envelopes, semitone and octave pitch transpose, phase and key tracking controls. The plug-in also includes global low-pass filter, velocity and volume controls as well as presets created by sound designers System DFL and Hinton & Fairchild. 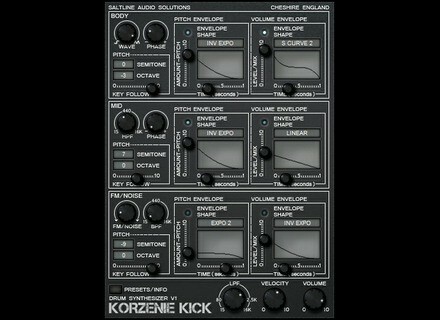 Korzenie Kick is available for download from www.saltline.co.uk. Korzenie Clap is still in beta phase and available for free on the Saltline Facebook page. The second plug-in in this series features two layers, each with two envelopes, a modulation section with adjustable speed and depth, pan and distance as well as a multimode filter (high-pass, band-pass and low-pass). You can also globally control the high-pass filter, velocity and volume, and presets are included. New Tek’it Audio Uinku distortion plug-in The new Tek’it Audio Uinku plug-in is a foldback distortion in VST and AU formats for Mac OS X and Windows. The HALion Symphonic Orchestra out of Cubase Steinberg now offers its HALion Symphonic Orchestra sample library as a standalone plug-in and expansion pack for HALion. $240 off the new Boz Digital Imperial Delay Boz Digital Labs finally found the name of its new plug-in and offers a huge discount for the introduction of the Imperial Delay.